A modern distillation of the traditional English banking chair, our Regent Swivel Chair makes it a pleasure to engage in a day’s work. Unlike other office equipment, this chair’s curved, willowy design makes it a beautiful, useful addition to your home office. Handmade in cherry or walnut, the chair is marked both by its sweeping arms, which curve into its arched crest, and its artful use of leather upholstery. 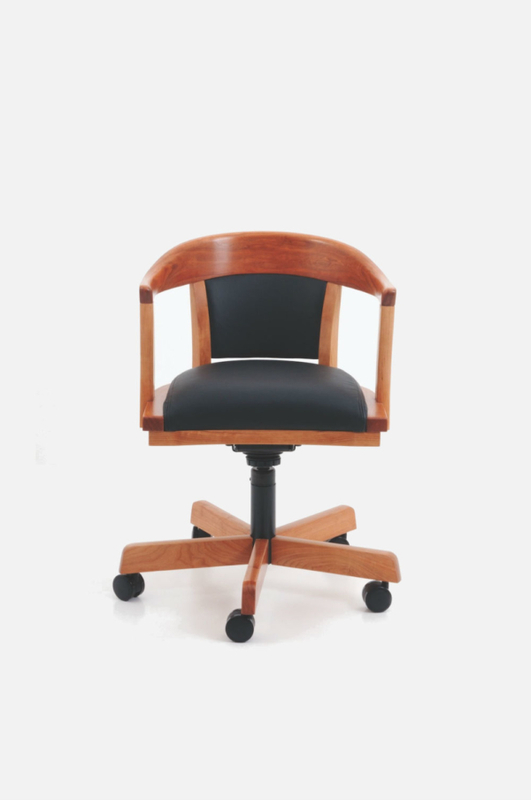 Resting atop a five-point, castered foot, the Regent Swivel Chair provides reliable stability, with subtle mechanics that make it effortless to turn from one task to another. 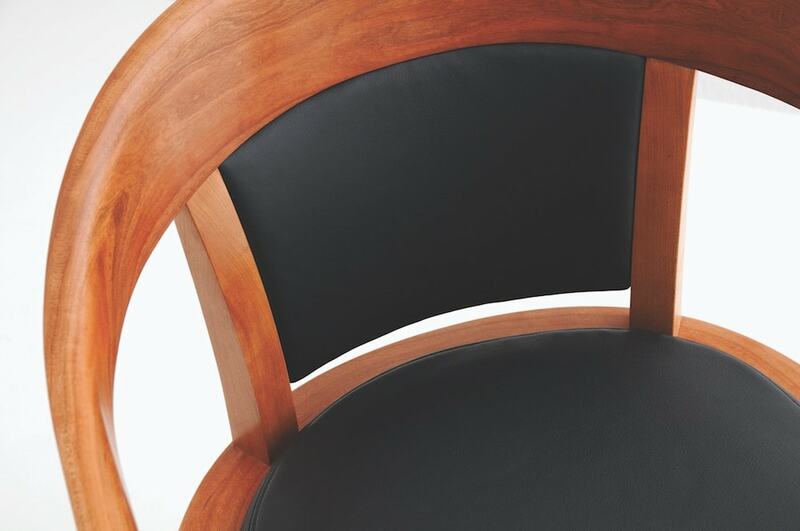 The familiar design of the Regent Swivel Chair is Moser in form and function, with handmade arms that sweep to form its substantial arched crest. 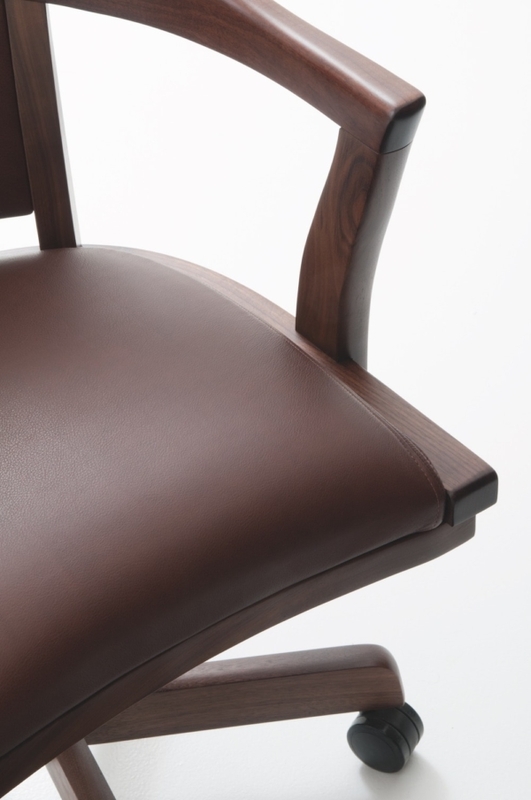 The chair provides abundant comfort, with a contoured back that’s enhanced by the thoughtful use of leather upholstery. Featuring a seat crafted from a block of grain-matched North American hardwood, the chair’s substance is evident. The leather cushion provides an added measure of comfort and contrasts beautifully with the wood on which it rests. 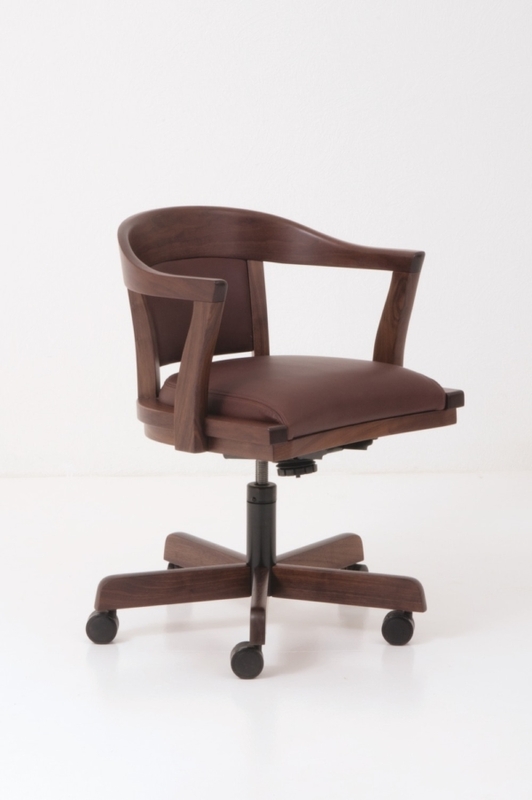 The Regent Swivel Chair’s distinctive seat design is enhanced by its stable, durable and functional base. Integrating with a swivel pedestal for easy movement, the chair’s base has five wooden feet that are mortise-and-tenon joined, and outfitted with smooth-rolling casters. The chair is elegant in its embrace of tradition – and its use of subtle innovation. A comfortable pair with our Four Leg Writing Desk or our distinctive Radius Desk, the chair’s beauty matches nearly any contemporary office ensemble.